The veto, which Cooper said would come by the end of the day Monday, will be only the second budget veto by a governor in North Carolina history. The first, Governor Bev Perdue in 2011, was overridden. Flanked by N.C. teachers, Gov. Roy Cooper announced Monday that he will veto the state budget. 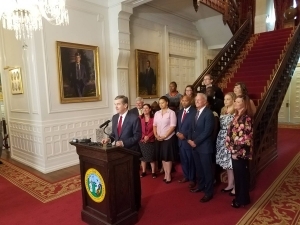 In a press conference flanked by North Carolina teachers, Cooper acknowledged the GOP super-majority in the N.C. House and Senate have the votes to override this veto as well. However, he said he would be willing to sign a revised budget after his veto if lawmakers were willing to make a few “simple” changes. 1) Eliminating a corporate tax cut in the budget and limit the income tax cut to those making less than $150,000 per year. 2) Increase and broaden teacher pay raises, including both new and veteran teachers, and include a classroom supply stipend as Cooper did in his proposed budget. 3) Invest in increasing broadband across across the state. 4) Phase out the private school voucher program. Most of those changes will be non-starters with Republican lawmakers, but Cooper said he will continue to urge “fair minded” Republican and Democrats who voted for the budget headed to his desk to do better. The state needs to honor that growth and “enable the big dreams” of the state’s people, Cooper said. It can do so by investing properly in education, infrastructure and future development, he said – and being sure that people across the state, regardless of their location or economic situation, share the same opportunities. “Unfortunately what the legislature passed and sent to me is not that budget,” Cooper said.